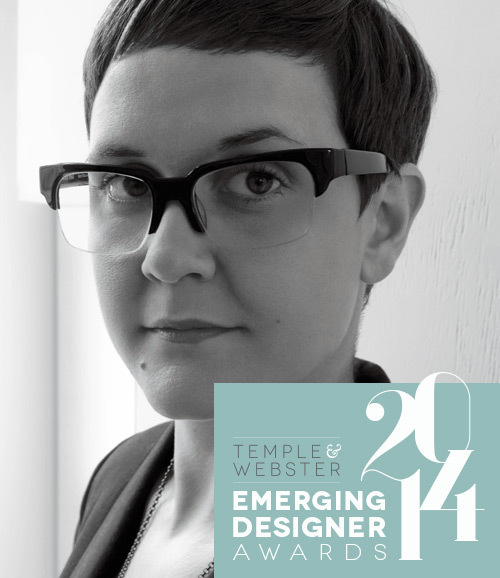 David Harrison introduces Cindy-Lee Davies of Lightly, one of ten nominees in the Temple & Webster Emerging Designer Award 2014. Voting will begin on 2 May 2014. Starting her brand 'Lightly' in 2005, which was named after her grandmother Rosemary Estelle Lightly, Cindy-Lee Davies began working around the concept of what she calls ‘Nanna Technology’. Originally Inspired by the decorative nature of doilies and lace that she worked into new materials using laser cutting technologies, Davies’ work has evolved over the years to focus more on a limited materials palette and a strong sense of the of reuse of materials and objects – a little in the way once done by the austerity movement in postwar Britain. Her recent designs such as the ‘Assemblages’ shelves move to organic tones utilising wood and leather, while the 'Caribbean' collection of pendant lights are rattan pendants with colourful highlights. 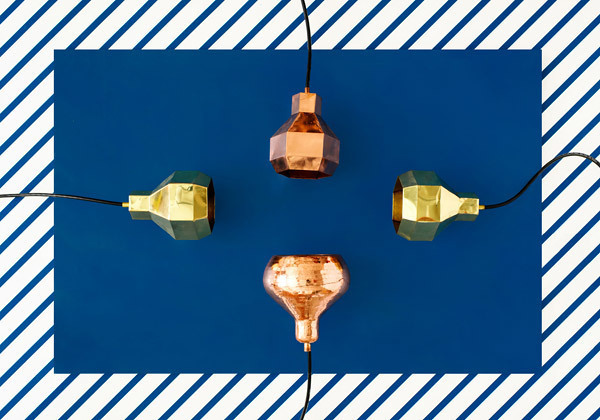 The faceted VI Lights in brass and copper pay homage to the hard-working honey bee. Image - Brooke Holm / Marsha Golemac. What is your biggest motivator, muse or inspiration when you are designing? My biggest motivator in designing is usually space. I most often do my best work when I get away and just design. Owning a small business you have a lot of daily demands on you, so I appreciate the space and tranquility to freely think without too many distractions. That to me is the greatest motivator. Travel and nature is the best inspiration. The Assemblages leather book girth combines a saddlery aesthetic with artisan skill. Image - Brooke Holm / Marsha Golemac. What has been the single most pivotal point or event in your design life so far? When we were approached to sell 5000 butterflies (made from saucers) to the USA for large design chain Anthropology, I wondered how on earth would I ever find that many saucers in Australia to produce. I had nightmares of every garage sale and op-shop for months. Eventually I found 5000 saucers in China heading to landfill – so I flew over and after many months we eventually got the project off the ground. For those who have been to China you’ll know it is quite difficult when doing something completely innovative to say the least, so I pretty much worked alongside my team daily to get the project realised. For me the greatest thing is that I did not have to compromise the ideology of project – yes we could have cast new butterflies but that would have missed the point as many people do - instead we successfully recycled 5000-6000 saucers for the design. It made me realise I really love what I do. 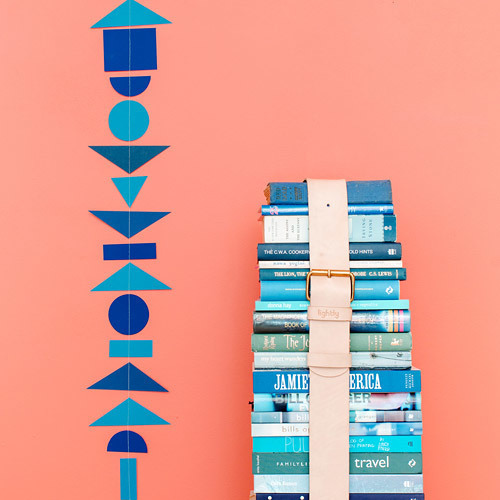 Lightly's Assemblages Leather Shelves hark back to the utilitarian resourcefulness found in early 1900s Australia. What existing object or piece of furniture do you wish you had designed? 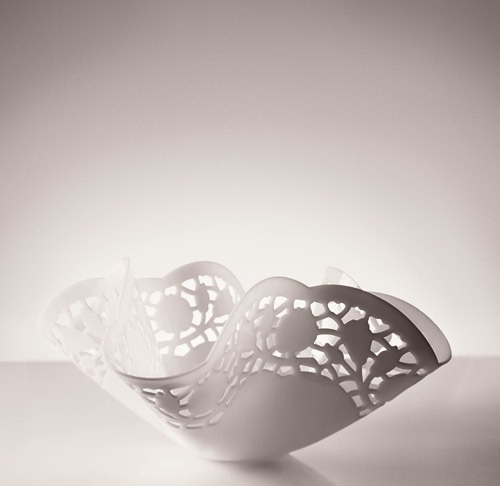 Lightly's Rosie Bowl, named after one of Cindy-Lee's grandmother's bridge friends, captures the delicacy of lace doilies..
'Lightly' is well known for its decorative pieces such as the butterflies cut from reclaimed teacup saucers. Recently you have produced far more utilitarian designs. What caused this shift? 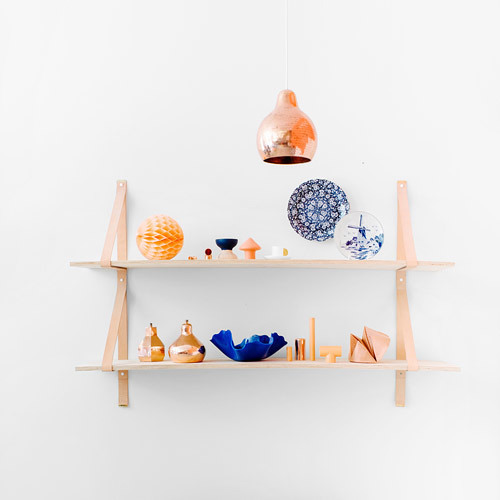 Since 2005, 'Lightly' has grown to include over 100 products which span the breadth of interior decoration - tableware, mirrors, cork ware, lighting, rugs, ceramics and hand formed vessels. All are imbued with the same heady combination of playfulness, charm and invention. The ornamental range drew a conceptual link between the lifecycle of the butterfly and the metamorphosis of discarded materials into beautiful objects, and created a collection of works made from reformed crockery. The shift to other materials and mediums is a natural progression in my interest in design and creating new interests for my clients. Originality is of great importance to me and being resourceful as creators when designing any product. Some ideas just take time to develop, like the Assemblages leather collection. 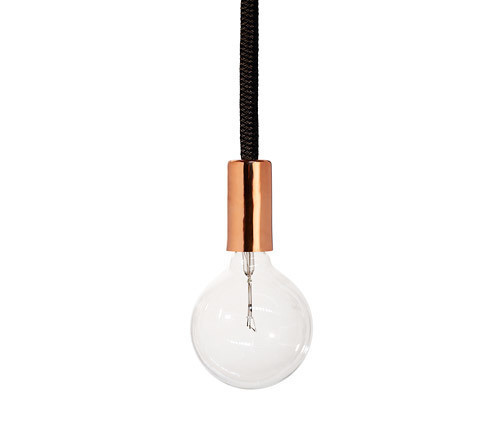 Lightly's signature Rope Light, in copper with black rope. You seem to have an interest in post WW1 austerity ideas – the reuse of objects and simple DIY solutions. Where did this come from? I am inspired by my grandfather who was in the Light Horse Regiment, which started in the early 1900’s, his involvement was during WWII in WA. The leather Assemblages range harks back to Australian utilitarian resourcefulness found in the lifestyle. It draws on the saddlery aesthetic: the artisan skill, the mix of leather girths and copper belt buckles, and the unmistakable smell of raw leather. Assemblages have been through a ten-year development process, starting out as a series of strap-based furniture made from recycled car seat belts, designed when I graduated in 2000 and started a label, ‘Props’. The simple DIY resourcefulness also comes from my childhood growing up on a farm. My brother taught me to weld by the age of 13 and my first studio was in a scrap metal yard welding sculptures for restaurants. 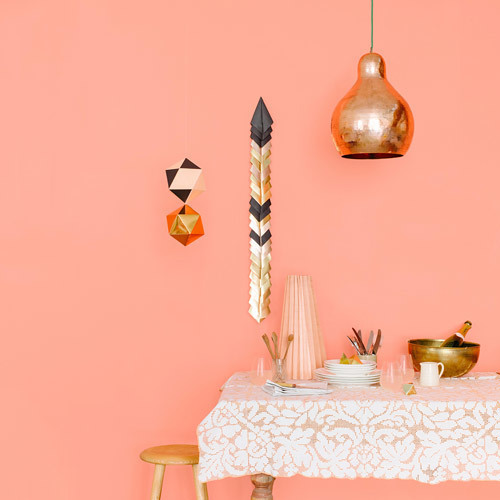 Lightly's Godfrey Copper Pendant is available in three sizes. You describe your work as ‘Nanna Technology’. What do you mean by this? I launched 'Lightly' in 2005 with a range of homewares and lighting inspired by lace and doilies created in homage to my late grandmother, Rosemary Estelle Lightly. I was marrying the aesthetics of traditional crafts with cutting edge technology such as laser and water cutting patterns in materials, lights and home wares. At the time this was a new style which Belle magazine first wrote an article on in 2005 entitled “Nanna Technology” and since then a lot of my work has referenced a nostalgic craft or storytelling combined with modern technology as a signature. To find out more about Cindy-Lee and her work, check out the Lightly website or follow her on Facebook or Instagram @lightlydesign. Vote now for your favourite Emerging Designer.